The REDARC 52mm G52-VA voltage gauge measures one voltage level and enables the monitoring of charging performance of either the main or auxiliary battery. The LCD/ LED display allows you to monitor the charging performance of either your main or auxiliary battery. In the event of an alternator or system failure, the voltage reading on the gauge will be low and drop as the battery discharges. In the event of an overcharge condition, the voltage reading will climb above its normal zone. The G52-VA gauge also has pre-set alert levels (<9V and >16V) to notify you of these situations by changing the gauge backlight colour to either amber or red, and initiate an audible beep when the vehicles ignition is on. The G52-VA gauge is also equipped with an optional 100A rated current display that monitors the amount of current to or from your main or auxiliary battery. This device can be fitted around the earth connection of the main or auxiliary battery. You will need to purchase the REDARC Hall effect current sensor (GS-AMPS) to equip the gauge with this function. When extra protection is required, the G52-VA is the perfect accessory for a REDARC dual battery isolator (SBI12) or in-vehicle battery charger (BCDC range) where a 12 volt battery is installed. It’s a visual monitor of product performance and battery health. The G52-VA gauge diameter requires a 52mm hole for mounting. REDARC offer a range of mounting solutions including a 2” black plastic mounting cup (GH-CUP) and one (GH-MP1), two (GH-MP2) and three (GH-MP3) hole gauge mounting panels. Radio inserts are also available that suit the Toyota Hilux (GH-RI05). The REDARC 24 to 12 volt adaptor (GA-2412V) can be used to connect this gauge to a vehicle with a 24 volt ignition and lighting supply, however only a 12 volt battery can be monitored. Multiple alert levels with amber or red backlight and audible beep - Alerts when Voltage drops below 9V or climbs above 16V. Display illuminates when park lights are turned on so you can check battery voltages and discharge or charge current without turning on the ignition. If fitting more than one REDARC gauge, a communications link can be connected between the gauges to change the backlight colour of all at once. 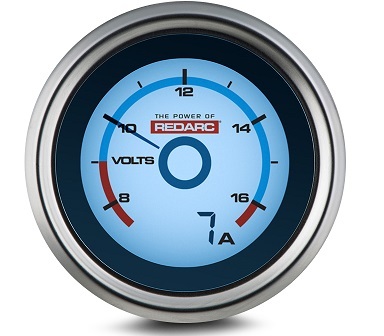 REDARC recommends the purchase of an Enhanced Lighting Controller (GA-ELC) with this gauge. The GA-ELC is designed to enhance the lighting of your REDARC gauges as only one required for a set. It is to be used when you do not have a dimming circuit to connect your gauge to or the dimming circuit in your vehicle does not dim the REDARC gauge to your liking. The GA-ELC also allows you to program night time brightness and colour of your REDARC gauges, including dimming if connected to a dash dimmer. Once programmed your gauges will change colour when turning on your park lights and back to a day light colour when you turn them off. The GA-ELC is also 24 volt capable. The G52-VVA is also available as part of several Value Packs, offering a great saving on combined purchases. Note: Optional accessory, not included with standard purchase. You may return most new, unopened items within 30 days of delivery for a full refund less a 20% re-stocking fee and any shipping costs which are unable to be retrieved. Frankies will pay the return shipping costs if the return is a result of our error (you received an incorrect or defective item, etc.). The balance of the refund will be issued as a store credit for purchase of your next product or paid directly back into your PayPal account. You should expect to receive your refund within four weeks of giving your package to the return shipper, however, in many cases you will receive a refund more quickly. This time period includes the transit time for us to receive your return from the shipper (5 to 10 business days), the time it takes us to process your return once we receive it (3 to 5 business days), and the time it takes your bank to process our refund request (5 to 10 business days). To organise a return of an item, please contact the store the purchase was made from, either via phone, email or dropping into the store.